I’m pretty sure this has been said countless times in past reviews I’ve written over the last several months but the Nintendo Switch has become the ideal home for the puzzle genre. The best examples make it easy to lose a number of hours sat on the sofa at home while also perfect for those short train journeys as a way to pass the time. While it’s easy to be amazed by the fact we are playing these huge AAA adventures pretty much anywhere we want, puzzlers feel like the best fit overall, hence why we’ve been seeing so many of them popping up on the Nintendo eShop. Is Qbik a worthy addition to that ever-growing list though? In Qbik you play as a blueish greenish square with a single eye and a giant mouth eating your way around a series of stages. The aim of each stage is to shuffle along gobbling up every yellow block in sight. The catch is you’re only able to move along left or right, falling downward or chomping away at yellow blocks above you. It’s this simple concept that makes Qbik far more complex than first meets the eye as any missed blocks above you are sadly then out of reach. Therefore a player’s success in Qbik is only achievable if you plan ahead and map out your every move. While one incorrect attempt is easily fixable with a quick press of the undo button, this is not a game where you can simply rely on trial and error – especially as the game throws more ideas your way including moveable blocks and teleport devices. With only a little over sixty stages to play through, Qbik isn’t as bulky as other puzzlers currently on Switch. However thanks to a rather sharp difficulty, you won’t be breezing through these easily. In fact, the game’s harsh difficulty can be one of its biggest issues. 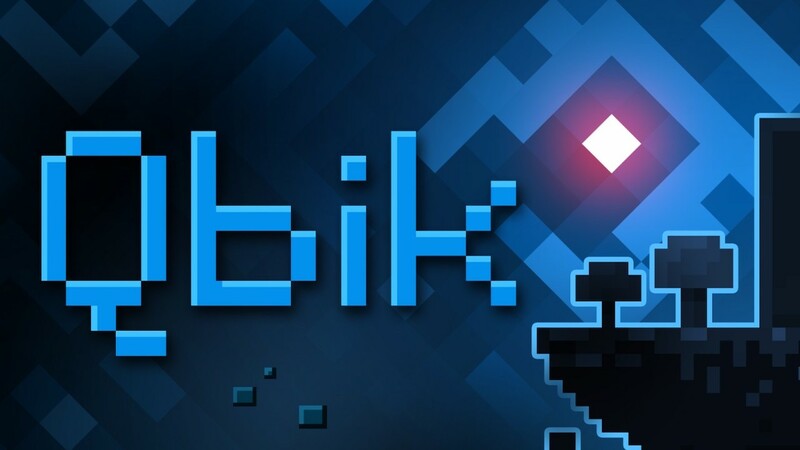 While early levels ease you nicely into what Qbik is all about, as you progress further so too does the level of frustration, especially as the rooms you face grow bigger and more complicated. In fact, a number of my hours were spent banging my head against a wall stuck on a particularly troublesome puzzle. With very few chances to skip past these nuisance stages, your progress and the game’s momentum can come to a halt. Still, if you like your puzzlers tough as nails then Qbik will certainly meet that criteria. A rather appreciated addition is the Level Editor, a tool that allows you to create your own mind-bending puzzles for others to rack their brains over. Everything you may have faced in your playtime with the single player is available for use here giving you the freedom to go as simple and easy or bigger and complex as you like. Unfortunately, you will only be able to demo these creations locally as Qbik offers no online sharing feature whatsoever. It feels like a real missed opportunity here especially when you consider other versions of the game already have online functionality included. One thing that I found to be very off-putting in Qbik was its audio. While the echo-heavy background music does create a nice atmosphere, unfortunately, the constant squelching as you chomp away at yellow blocks is just terrible. Annoyingly since the main focus of the game is eating away at these blocks you’ll spend an awfully long amount of time hearing these gross sounds. Sure you can turn the sound off in settings, but it begs the question why not just use a less obnoxious sound to begin with? Qbik isn’t going to win any “best in genre” awards anytime soon; however, it’s a neat enough distraction and one at a bargain price. While its presentation feels a little bare bones and the game’s difficulty unforgiving, there’s just enough here to make Qbik worth a look if you’re a fan of your puzzle games.